To this date, there are authorised English translations of four short texts of Květoslav Minařík. Further translations are being prepared and the first book with the collection of short text in English will be available later. Please contact us for more information. You can also find these texts on www.scribd.com (1, 2, 3, 4). How to attain the Buddhist jhanas by means of Yoga. Excerpt: Someone said that yoga is a struggle for quality. This can be understood by it been a struggle for the best inner state, for the clearest state of consciousness, for the highest vigilance, for a state of mind without ill will, hatred and for development of its clarity, for the best emotional states, etc. – for states of a purely positive character. Short text about joyfulness in connection with spiritual path. Excerpt: ....Therefore, it is necessary to rejoice. The very joyfulness, in particular the causeless one, is that spiritual arrow, by which it is possible to bring down the seemingly uncontrollable human nature, which once wants to rejoice, and then after saturation by joyfulness again suffer, to never leave the fluctuating path and to prevent a person from ever escaping from suffering forever. Short text about Yoga in its original conception. Excerpt: The problem of a happy or unhappy life is an emotional problem. Because, from the point of view of yoga, this problem has to be resolved as the first, yama is prescribed as the first step towards the yogic training. Yama means the discipline of emotion. By the help of it, happiness is literally “produced”. 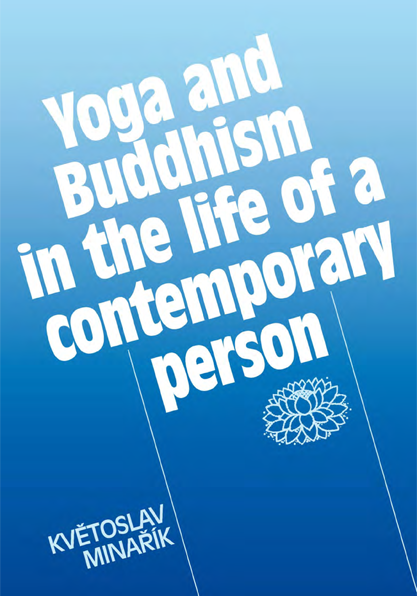 The theme of this book is Yoga and Buddhism as a way of life. It is a small selection of texts that Květoslav Minařík wrote during three decades as answers to the questions and problems of those interested in the spiritual life and spiritual teachings. First steps in Yoga in its original conception. Excerpt: We will not sit in a position to become happy and to outshine our social environment. We are going to learn how to be happy, in order to be able to sit still and thus create conditions to be able to, of our own will, enter the transcendental world, which however has to be understood in a different way than until now.